Abstract: A semi-automized code has been used to identify individuals who are refered to on more than one occasion in the source, the “Freiburger Bürgerbuch” (1341-1416) . This code is made up of parts of the family and first names. It allows the orthographic and phonetic variants of the same name to be taken into account. The plausibility of the grouped names is then automatically tested. The final decision about the identity of the names has, however, to be taken by the historian. Introduction: The identification of persons, property and events is a well known procedure in historical research. Every compilation and representation of data concerning persons, groups of persons, events or property purports to add together information concerning identical units. For a long time this identification process was based only on the historical experience of the inquirer, but the use of electronic data processing today obliges the historian to explain his methods and thus the whole process of identification becomes more accurate and easier to control. In the following paper, we shall describe the method used to identify persons in the project “Freiburger Bürgerbuch 1341-1416”. 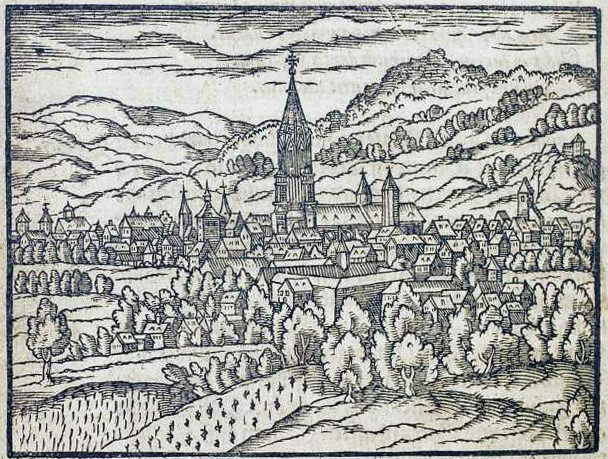 The first “Bürgerbuch” of the town of Freiburg in Switzerland from the year 1341 to 1416, is the most important medieval source of this kind in Switzerland . This source contains 2200 inscriptions with 7000 names. Each inscription includes the name of the “Bürger” his occupation, social position, place of origin and kinship relations. It also includes a “security-object”, such as a house, which can be situated from its road name, its owner and from the owners of the two neighbouring houses . The same person can therefore appear frequently in the book: as a “Bürger”, as an owner, or as a relative of someone else.